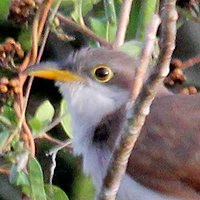 The cuckoo family includes the cuckoos, roadrunners, koels, malkohas, couas, coucals and anis. 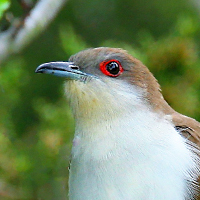 The cuckoo order Cuculiformes is one of three that make up the Otidimorphae, the other two being the turacos and the bustards.The cuckoos are generally medium-sized slender birds. Most species live in trees, though a sizeable minority are ground-dwelling. The family has a cosmopolitan distribution, with the majority of species being tropical. Some species are migratory. Cuckoos have played a role in human culture for thousands of years, appearing in Greek mythology as sacred to the goddess Hera. In Europe, the cuckoo is associated with spring, and with cuckoldry, for example in Shakespeare's Love's Labours Lost. In India, cuckoos are sacred to Kamadeva, the god of desire and longing, whereas in Japan, the cuckoo symbolises unrequited love. 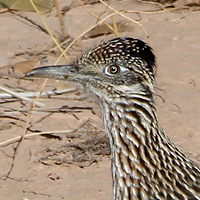 2 species of Cuckoo, and the Greater Roadrunner occur in Utah.